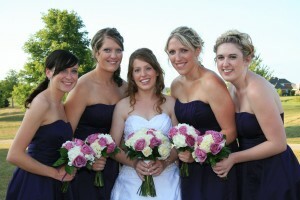 This wedding took place just last weekend, so I’m tickled pink to be able to share these photos with you already. So a giant thanks to Ashley Biess Photography for these amazing pictures. The first time I saw them they gave me goosebumps. Rather than the typical round hand-tied bouquet Beth wanted the bouquets to have a natural, garden-inspired feel for her outdoor fall wedding. I love the ivory lily in her hair. It is the perfect finishing touch to the polished by relaxed look Beth was aiming for. 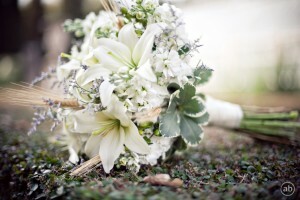 The bride’s bouquet was a omantic, garden-inspired hand tied of whitesand ivories accented with lavner limonium, light greens, and a touch of fall wheat. 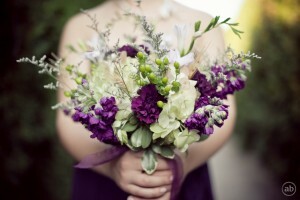 Garden textures in shades of purple and green come together in this romantic and relaxed bridesmaid bouquet. 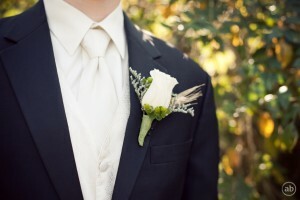 The groom sported an ivory boutonniere accented with wheat, lavender limonium, and green hypericum berries. Thank you to the radiant bride and groom for letting us be a part of your wedding day! With our sincere blessings for your marriage- Congratulations Beth & Andrew! Thanks again to Ashley Biess for the beautiful photographs. 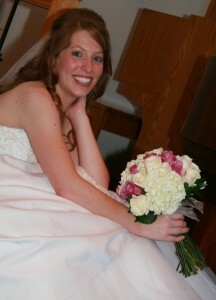 pictures from her wedding day. 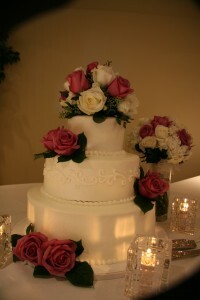 The cake was decorated with the white and warm lavender roes.